In today’s article we are going to be discussing diamond alternatives and showing you some beautiful engagement rings without diamonds as their main feature. At Omori Diamonds, we are a premier designer and creator of exceptional custom jewellery and engagement rings in Winnipeg and receive many requests from couples looking to create their special custom ring. Today we would like to show you some of our favourite designs from both our portfolio and catalogue which make use of the wide variety of fine quality precious gemstones that we have available! When it comes to selecting a stone for a non diamond engagement ring, the ceylon sapphire ranks as our top choice. Aside from diamond engagement rings, we probably create more sapphire engagement rings than rings with any other kind of gem. Like diamonds, sapphires are incredibly durable and hard and will wear very well over time. This means they are an excellent choice for any piece of custom jewellery which one plans to wear for a lifetime. 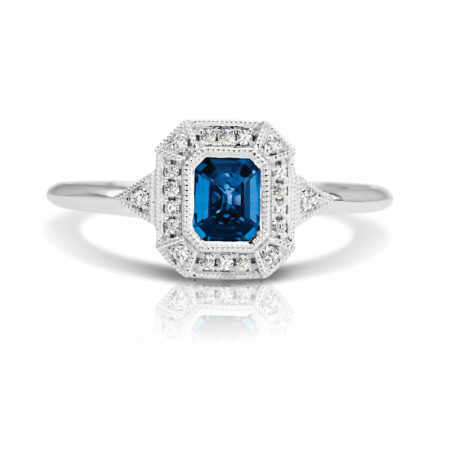 Did you know that the wonderful blue ceylon sapphire in Kate Middleton’s engagement ring was once the centre stone in the ring belonging to Princess Diana? Sapphires are also incredibly versatile and can go beautifully in both modern and vintage styles of designs. They can come in a wide variety of colours from bright sunny yellows, blues, purples and soft pink colours as seen in Lady Gaga’s engagement ring. 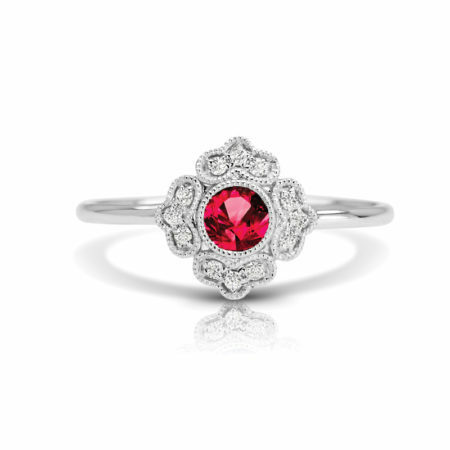 Next to sapphires, ruby engagement rings definitely top the list for the most popular alternatives to diamonds. As a matter of fact, rubies belong to the same mineral family as sapphires, known as corundum and they are also very hard and durable. 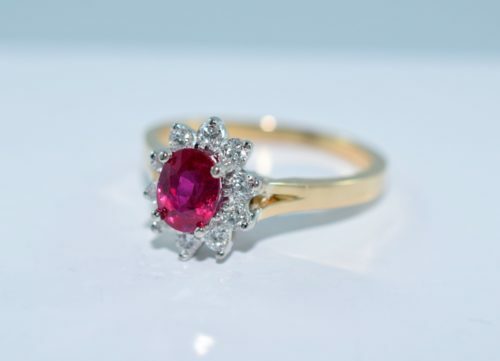 A favourite among celebrities such as Eva Longoria, rubies are loved for their deep romantic red colour as well as brilliance and go beautifully in vintage engagement rings as shown above or in floral halo style rings like in the photo below. If you have been active on instagram lately, you have probably noticed the rising popularity of moissanite engagement rings. Moissanite is a stone which is usually synthetically created and has an appearance very similar to that of diamonds. They are incredibly hard and, can exhibit enormous amounts of brilliance and sparkle. In fact, moissanite can actually appear more brilliant than diamonds and show a larger range of colours in the sparkle such as blue and green. 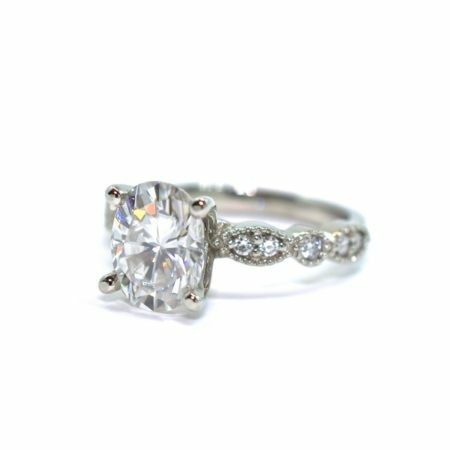 One great benefit of choosing a moissanite is that they are considerably less expensive than diamonds and so your budget may allow you to afford quite a larger stone. First mined in ancient Egypt, emeralds have always often been thought of as a truly royal stone. This beautiful green gemstone is an excellent diamond alternative as its unique colour makes for an excellent feature of any custom ring. 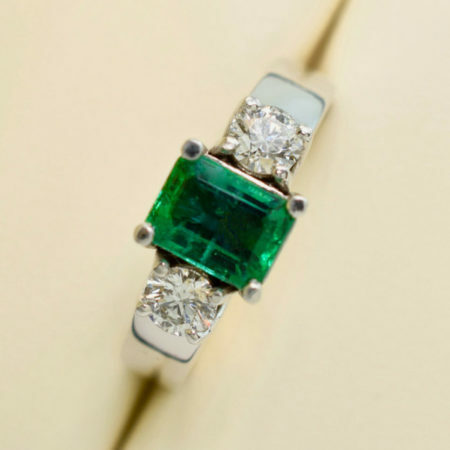 For those of you who are interested in celebrity engagement rings and jewellery, be sure to have a look at Jackie Kennedy’s engagement ring as it was known to feature a beautiful 2.88 ct emerald along side a number of diamonds of different shapes. Thank you for checking out this article on diamond alternatives and engagement rings without diamonds. We hope you have found this article useful and have perhaps found some inspiration for your next design. Don’t forget to connect on facebook, twitter or instagram!